Kim Jong-Un and North Korean first lady, Ri Sol Ju, enjoyed on Sunday a K-pop performance in Pyongyang as tensions between the two Koreas appear to soften. It is the first time that a leader of North Korea attends to a South Korean performance in Pyongyang. This time, Kim appeared to be excited by the performance as he was seen clapping to some songs. He also took photographs with the singers once the show was over. Earlier that day, they also saw a separate taekwondo performance sent from Seoul. 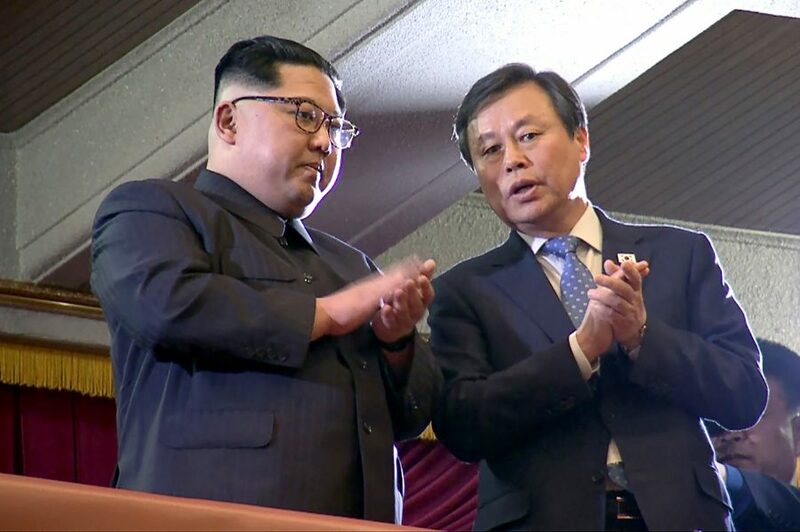 “[Kim Jong Un] showed much interest during the show and asked questions about the songs and lyrics,” announced the Culture Minister Do Jong-whan to reporters after the show. For example, it is essential to recall that athletes from North Korean and South Korea marched together under a unified peninsula flag at the opening ceremony of the Winter Olympic Games that took place in Pyeongchang in February. As well, Kim Jong Un has shown he is willing to negotiate and meet President Trump. Sunday’s two-hour concert is a proof that South Korea is also willing to improve the inter-Korean relations. South Korea sent a delegation of artists and diplomats to the north. They included singers, concert staff, taekwondo demonstrators and reporters among them. It was all part of a reciprocal cultural visit since North Korea sent performers in February to its southern neighbor. Let’s remember that North and South Korea are still at war since the Korean war (1950-1953) since they never sign a peace treaty, only a ceasefire agreement. “Spring is coming” was the title of Sunday’s concert. It was held at the East Pyongyang Grand Theatre. Eleven elite South-Korean artists performed. Among them were the veteran vocalists Cho Yong-pil, Lee Sun-hee, rock star Yoon Do-hyun, singer Baek Ji-young and the K-pop girl band Red Velvet. Seohyun, a female vocalist and actress, sang a North Korean pop song called “Blue Willow Tree”. 68-year-old singer Cho Yong-pil sang some of his hits including “The Cafe in the Winter,” “Short Hair,” and “Let’s Go on a Trip.” Cho had already held a solo concert in Pyongyang in 2005, which was the last concert by a South Korean artist in the North before the spring-is-coming show. As well, the of South Korean taekwondo demonstrators performed at the Pyongyang Taekwondo Hall I front of more than 2,300 north Koreans including Choe Hwi, chairman of the National Sports Guidance Committee.